Making south Indian coconut chutney for dosa and idli is very simple; just blend fresh coconut with chillies, curd and ginger and mix tempered mustard seeds. However, the real taste differentiators in this recipe are roasted chana dal, tamarind paste, cumin seeds and curry leaves. Follow this recipe and discover how good the chutney tastes, and yes, don’t blame us if you get addicted to it. 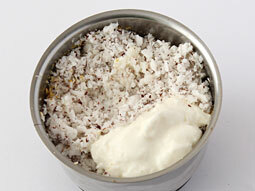 Take chopped coconut in a small chutney jar of food processor or grinder. 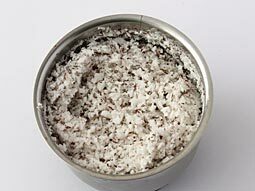 Grind it to make a medium coarse paste and transfer to a plate. 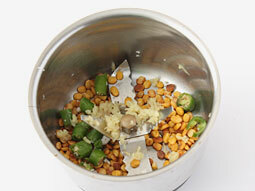 Add green chillies, roasted chana dal and ginger in same chutney jar. Grind them to a smooth powder. Add crushed coconut, curd, lemon juice, salt and 1/2 cup water. Grind them to make a medium coarse paste. 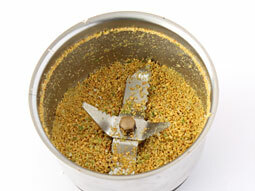 If required, add more water to get desired consistency of chutney and grind again. Transfer it to a bowl. Heat oil in a small tempering pan. Add mustard seeds. 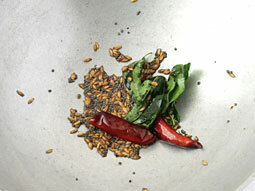 When seeds begin to crackle, add cumin seeds, dry red chilli and curry leaves and sauté for 10 seconds. 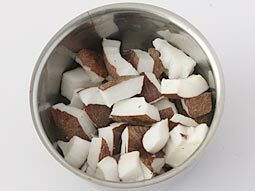 Take away pan from flame and immediately pour tempering over the prepared coconut paste and mix well. 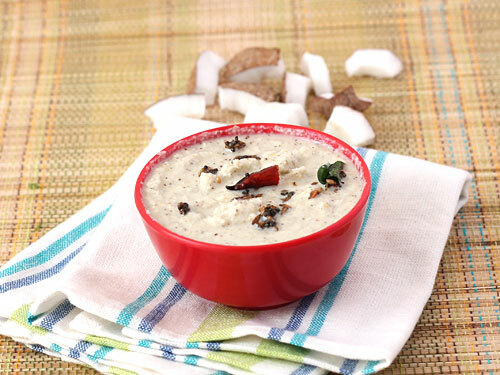 Coconut chutney for idli and dosa is ready; enjoy it with your favorite type of dosa. 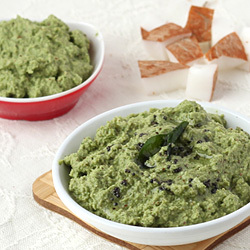 Consume fresh idli-dosa chutney immediately or refrigerate it and use it for up to 3 days. Serving Ideas: It’s hard to imagine south Indian dishes like dosa, idli, vada, etc being served without it. However, its use is not just limited to it, as it can be served as an accompaniment in lunch or dinner along with paratha, curry, steamed rice and dal tadka. I liked your chutney receipe very much. Very simple and easy to follow recipes. Awesome. I made for our kitchen staff, they were excited. Very fresh, delicious and nutritious! It's awesome and it's very delicious and spicy too. Good & simple method to follow. 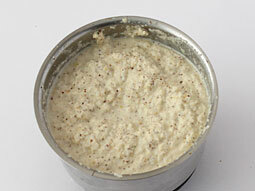 Method of making Coconut chutney seems to be quite simple n easy. So yum and just how I remember it from growing up in SE Asia. I used plain yoghurt in lieu of curds and it worked out nicely. I like the slight tang. I can't do dosas without it. It would be like pancakes without maple syrup - sad and lonely. Is it American rice or pony to soak for dosa? Response: Hello Shanthi, ponnie rice (idli/dosa rice / parboiled rice) and normal rice, both are used to make dosa batter. Follow this link of dosa for exact measurements of rice. Superb recipe. I love it. Thank you. Thanks for the tasty recipes. What an awesome recipe. It is my favourite chutney recipe now. Super recipe tried today everyone loved it with paddy. Thanks! It was so delicious. I would like to prepare it daily. Response: Thank you Ruchi for trying the recipe and sharing the wonderful tip. Very cool presentation. Perfectly described and illustrated. Thank you I shall definitely be coming back to food viva for all my South Indian dishes! Cooking made so easy for first timers. Great ideas showed by step by step method keep it up! Should I soak the chana daal before roasting? Response: Hi suchita, there is no need to soak chana dal before roasting in this recipe. thank you for step by step recipe.Easy to follow. I tried the white chutney it turned good. It had a great taste. Awesome we now use this recipe in our restaurant !